All transactions are safe and secure with a reliable history in online purchasing behind each of our associates. 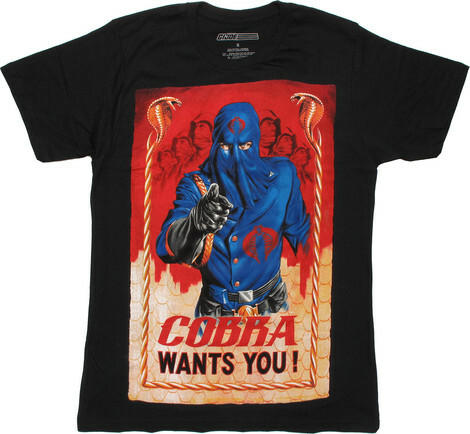 Buy the Cobra Wants You t-shirt to own G.I. Joe clothing and merchandise. These G.I. Joe t-shirts feature a vintage poster style design that reads, "Cobra wants you!" Collect one today with 1960s vintage G.I. Joe Action Soldier figures. Initially, there were 4 figures to represent all four branches of the armed forces. Action Soldier represented the Army. This led to the coining of the term "action figure". Add this classic Uncle Sam inspired design or a costume tee to your collection of G.I. Joe clothes and toys. In addition to the Cobra Wants You tee above, browse the G.I. Joe Clothing Gallery for more apparel like men's and women's clothes, kids shirts or hoodies.